Latinas get their inspiration and information from somewhere and/or someone, and in our POPSUGAR Insights 2015 Hypercultural Latina study, we found out who they seek out and where they go to stay ahead of the curve. Within their circle of influence, Latinas look to their family (79%), spouse/significant other (44%), and friends (42%). Individual influencers within a Latina's circle of influence have a significant impact on specific topics. For example, moms are most influential about topics such as food/cooking, parenting, and home/decorating, whereas friends are most influential on topics like fashion, beauty, shopping, and entertainment news content. 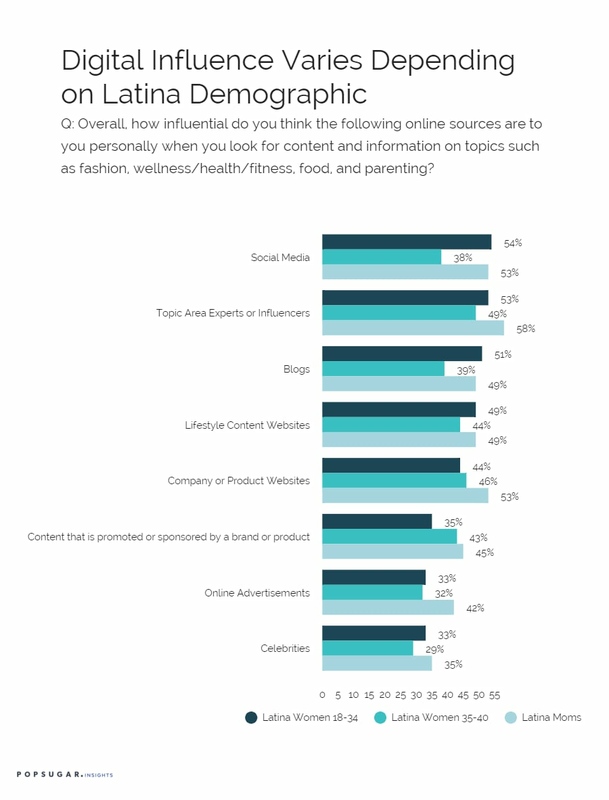 When asked about influential online sources, the top three for Latinas are topic-area experts (52%) and social media (51%), with blogs and lifestyle content websites tied at 48%. Latinas are also more inclined to be influenced by sponsored content (37%) and online advertisements (33%) than the general US female population, where only 32% are influenced by sponsored content and 27% by online advertisements. When you segment by demographic — millennials, Latinas age 35 to 40, and Latina moms — the story is a bit different. Latina millennials and moms are similarly influenced by social media, blogs, lifestyle sites, and celebrities. However, they are worlds apart when it comes to company or product websites, sponsored content, and online advertisements, where moms are more influenced than their younger counterparts. Latinas 35 to 40 are not as influenced by celebrities, blogs, or social media, but they rely more on company or product websites, experts or influencers, and lifestyle sites. Where Latinas are most unified in their online sources of influence, no matter their age or life stage is the influence of lifestyle websites.